Thanksgiving simply wouldn’t be Thanksgiving without a big batch of mashed potatoes. 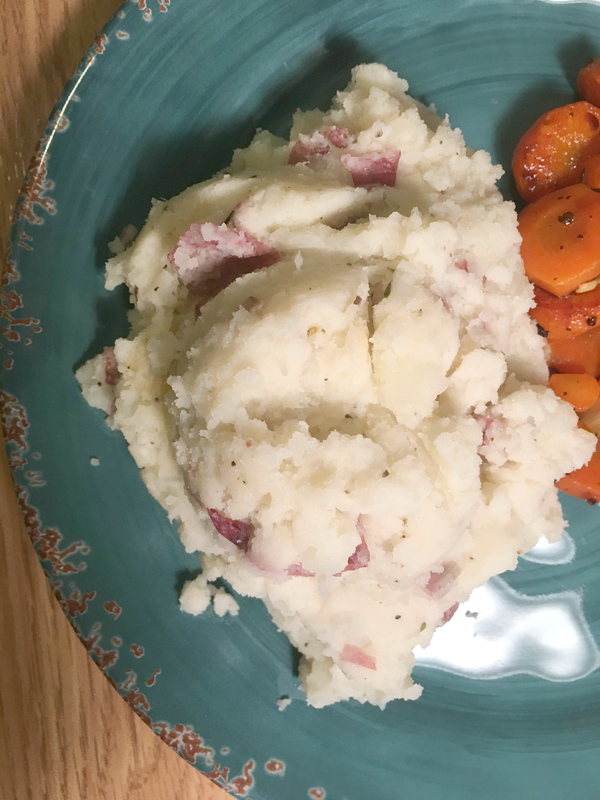 And these mashed potatoes were the best mashed potatoes I have ever made (rivaling the best restaurant mashed potatoes, if I do say so myself). Note: affiliate links used within this post. 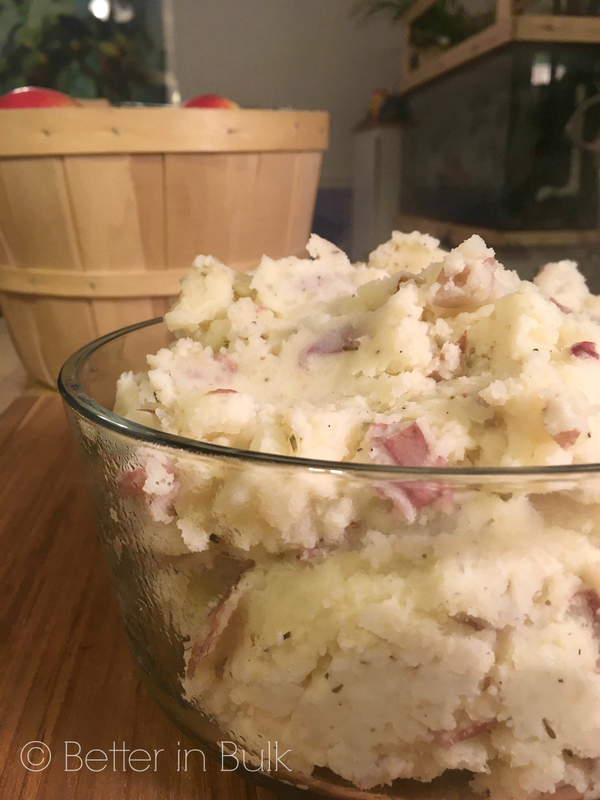 I was so pleased with how well these glorious garlic herb mashed potatoes turned out, and what’s better is that they can easily be made ahead and heated whenever you need to serve them. One of my biggest challenges on Thanksgiving (and other holidays where I’m preparing a large meal for many…wait. That sounds like a typical night at our house!) is that I have to make too many things at once. I love finding recipes that can be made ahead and then made ready when we’re ready to eat. Of course, this mashed potatoes recipe is perfectly suited to eating right away, but if you do need some extra time (whether you’re making them in the morning and keeping them warm in the crock pot or making them the day before and heating from cold before the big meal) these potatoes are perfect for heating and serving later! If your potatoes get a little dried out after being in the fridge, just add a little bit of milk. Boil water in a large stock pot. Wash potatoes but leave skins on. Cut potatoes into bite-sized chunks and add to boiling water. Boil for 5-10 minutes, or until potatoes are fork-tender. Drain potatoes; add to a large mixing bowl or crock pot. Add all other ingredients to hot, dry potatoes. Using a potato masher, mash and mix everything together. At this point, you can serve the mashed potatoes immediately, leave them in the crock pot on low or warm until ready to serve or cover tightly and refrigerate for several hours/overnight. Before serving, add cold mashed potatoes to the crock pot and heat on low til warmed through. I added some delicious pan gravy to these potatoes, along with a side of carrots cooked in my cast iron skillet. My mouth and tummy were very, very happy! Mashed potatoes are my favorite side, and these sound incredible! Thanks for sharing at Merry Monday! Ummm, excuse me but where’s the GARLIC??????? Did you forget to put it in the list? 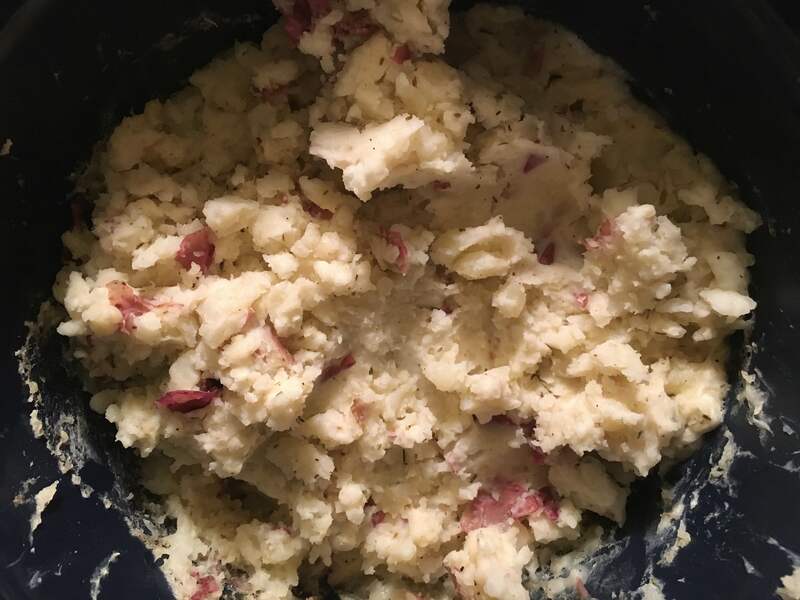 I love using red potatoes in my mashed potatoes because they have a lot of flavor. I like this awesome recipe and will make it soon. Thanks for sharing. These mashed potatoes look super good. I have never used cream cheese in mashed potatoes before. I will have to try these. Homemade beats the boxed kind anyday in my book. And I love the extra flavors you have in here. Thanks for sharing on the #HomeMattersParty . I hope you will join us again next week. These mashed potatoes look great. They seem like a great recipe for Thanksgiving and Christmas to make ahead. If you are making a large meal, it’s always nice to make a few things the night before. The sour cream and cream cheese must add a unique flavor. Great idea to try for the holidays! Love, love, love mashed potatoes!